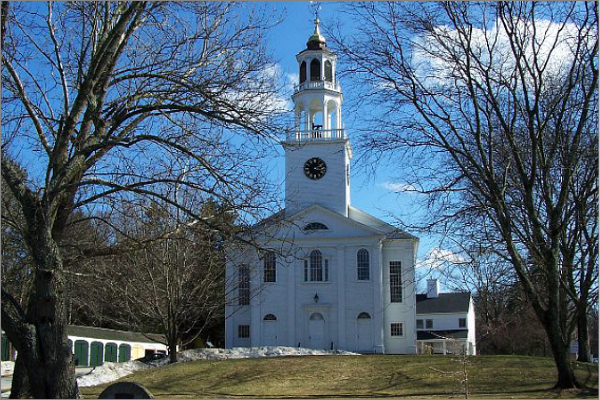 First Parish Church in Wayland was founded by a group of colonists who settled near the east bank of the Sudbury River in 1638. 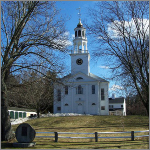 The first meetinghouse was built two years later. The town, originally known as Sudbury Plantation, was renamed Wayland in 1835. 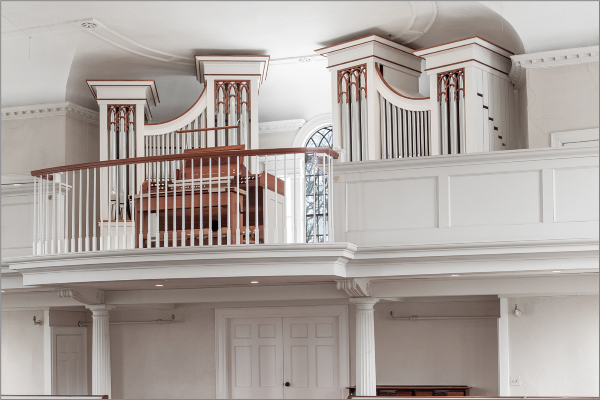 The present 1814 meetinghouse, the fifth in the church's history, was modeled after designs of Federal period Boston architect Asher Benjamin. Viewed today from the old Boston Post Road, the meetinghouse, with its long row of carriage sheds to the east, looks much as it did in 1814. 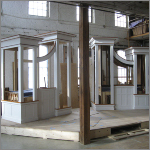 Together, they form a picturesque focal point for the Wayland Center Historic District. The church embraced the Unitarian doctrine in 1825. From 1839-1840 and 1848-1865, its minister was Edmund Hamilton Sears, a prominent writer and social reformer. His well-known carol text, “It Came Upon the Midnight Clear,” was first sung at the church's 1849 Sunday School Christmas celebration. 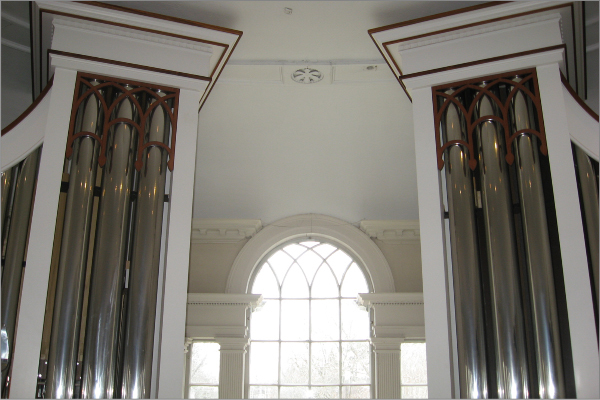 The first organ, "a small second-hand organ with false wooden pipes in front and having three stops," was bought by subscription in 1831. 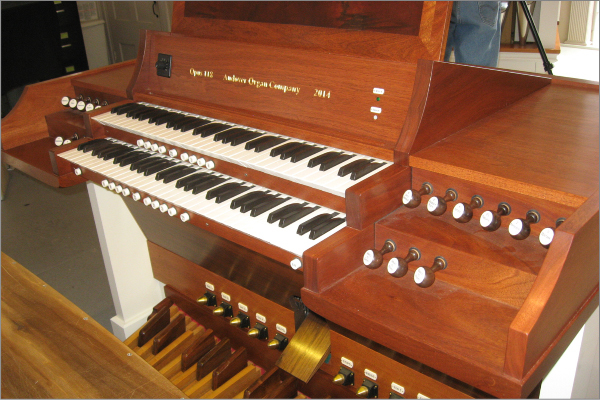 The second organ, a one manual, nine stop E. & G. G. Hook, Opus 402, was installed in 1866. 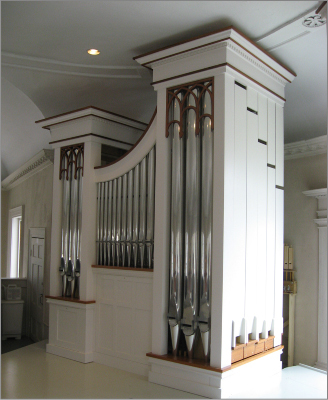 The third organ was a second-hand 2 manual Estey organ, Opus 1082, originally built in 1913 for the Bethany Baptist Church in Wilmington, Delaware. It was moved to Wayland sometime after the Bethany Church merged with another and sold its property in 1931. 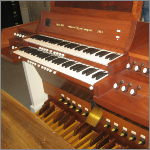 In 1962 the church installed its fourth organ, a 2 manual, 14 rank Rieger Salzburg Model. 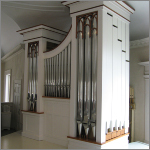 This instrument had a functional Modernist case, a Neo-Baroque stoplist, bright voicing and no expressive division. It served the church for 51 years, playing its last service in November 2013, before being sold and shipped to Colorado. 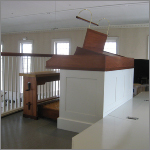 In anticipation of the meetinghouse's 200th birthday in 2014, the church laid plans to make all their buildings ADA compliant, construct a new wing to connect the meetinghouse with the parish house behind it, and commission a new organ for the sanctuary. 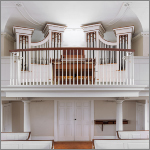 Many church members expressed a wish that the new organ not obscure the Palladian window on the rear wall of the gallery. 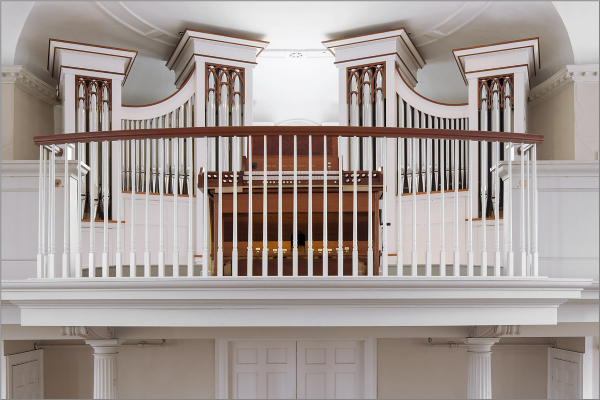 All of the organs since 1866 were guilty of this cover-up, due to the gallery's semi-elliptical rear wall. The only practical organ placement with such a floor plan was in the center. The church solicited proposals in 2012 from several prominent tracker organ builders. 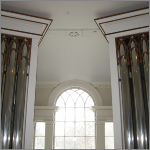 Andover's design, which split the organ into two halves, was the only one which accommodated, rather than covered, the Palladian window. 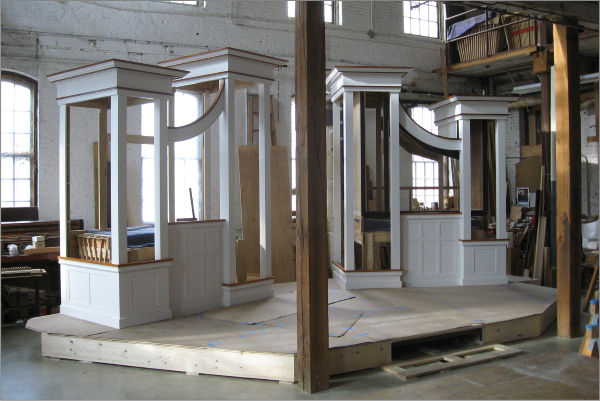 At Andover, we take great care to design the look of each instrument to complement the architecture of its surroundings. 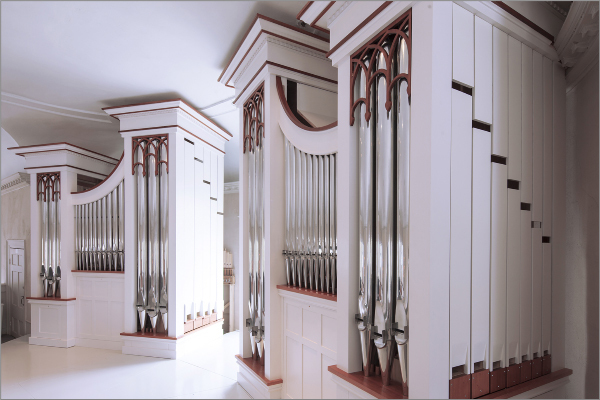 For Opus 118 we drew inspiration from the elegant cases of Thomas Appleton, Boston's renowned Federal Period organbuilder. Appleton's cases featured a tall center tower with shorter outer towers. Between the towers were flats of pipes with top moldings rising in graceful elliptical curves to the center tower. 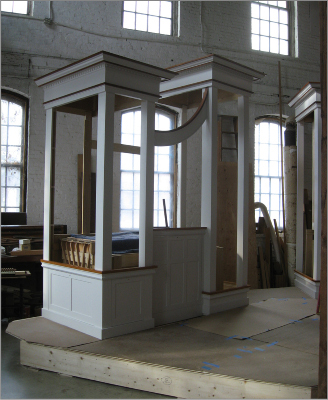 To split this design we used two tall central towers to frame the center window. 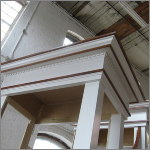 Opus 118 is housed in two mirror-image, white-painted cases which flank the Palladian window. Because of the semi-elliptical rear wall, the cases are angled to conform to the depth of the wall behind them. Thus, the outer front corners of the tall towers are three feet back from the plane of the outer corners of the short towers. 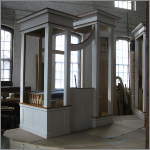 This case arrangement, and the raised platform we built to cover the tracker runs, creates a central seating area for over twenty choir members and envelops them with the sound of the organ. There is ample room at the sides of the platform for instrumentalists and a grand piano. The Great division is in the left case and the Swell in the right. The Pedal Bourdon and Principal ranks are divided diatonically between the two cases. 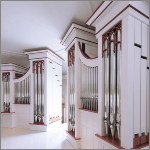 The 48 polished tin façade pipes comprise the lowest 24 notes of the Great 8' Principal and the Pedal 4' Choral Bass. To save space and effectively project their bass tones, the low 24 pipes of the 16' Bourdon form the outer walls of the four towers, with their mouths facing outward. Their trebles are behind the cases. The detached console has an oiled mahogany keydesk. Its low profile permits the organist to easily see and direct the choir. The rosewood drawknobs, with 19th century-style oblique heads with inset engraved labels, are arranged in stepped terraces. The center-pivoted manual keys have bone-covered naturals and ebony sharps. The manual key action is mechanical, as are the couplers and the swell mechanism. The two divided Pedal ranks are on electro-pneumatic offset chests. The stop action is electric, with a 10-level Solid State Organ Systems combination action. 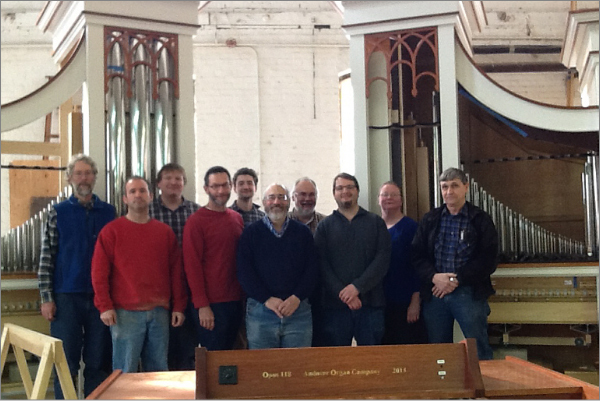 Opus 118 was unveiled at an open house at the Andover shop on February 8, 2014, attended by over three hundred people. 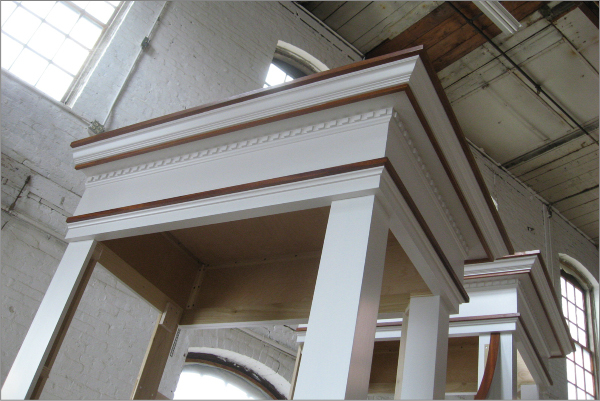 It was installed and tonally finished the following month. 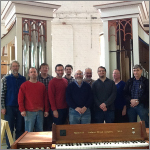 On Palm Sunday, April 13, 2014 the instrument was premiered to the congregation in a special morning service which featured a performance of Haydn's Great Organ Mass No.5 in E flat major (H. 22/4) for soloists, chorus, organ and orchestra, conducted by First Parish Music Director Pauline Oliver. 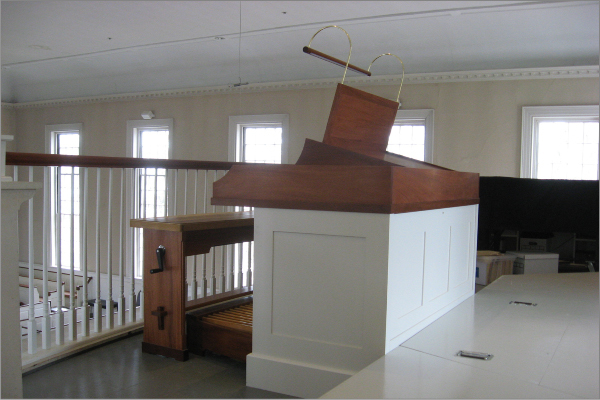 All who have seen and heard Andover Opus 118 agree that it is a very appropriate musical and architectural addition to the 1814 meetinghouse. 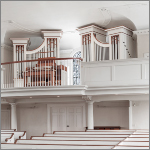 The church's decision to replace a stock-model organ with a new instrument, custom designed and voiced for its particular space, is a testimony of First Parish's ongoing dedication to fine church music and its continued appreciation of the pipe organ repertoire.